This really is a superb album - the vocals are fantastic and the music is flawless. Since bursting onto the scene in 2015, Cats in space have been busy. As well as touring with the lines of Deep Purple, Thunder and Status Quo, they’ve released three albums and are now preparing to release their fourth – Day trip to narnia. If you’ve never listened to them before, think 10cc mixed with 70s classic rock and a healthy dose of pop. They’re a great live band too and are so good they come across as a band that has been together for far longer than the few years they have actually been a band. “Tragic alter ego” is a great song that really does sound like something 10CC could have released. Part of that is the vocals, and part is the piano melody which really does remind me of 10cc. “She talks too much” is another 10cc style song. 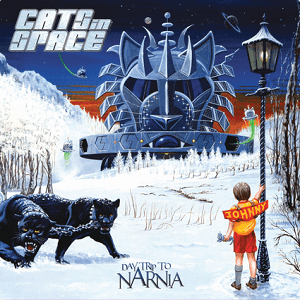 No rock album would be complete without a power ballad, and Cats in space haven’t missed that out – “Chasing diamonds” is an acoustic power ballad. The second half of the album is a seven part epic which over the course of 26 minutes tells the story of the character Johnny Rocket. It’s a great story arc and is more like an album in itself. The gatefold CD cover even includes a mini comic showing the story in just 9 pictures. The album really does use lots of diverse influences and sounds – “The story of Johnny Rocket III: Thunder in the night” for example is very much a disco song, whereas the opening of “The story of Johnny Rocket V: Twilight” conjures up memories of ELO. The thing is though that while you can pick out little bits here and there that remind you of something, the important part is how Cats in space take those different elements and weave them together to give you an absolutely superb album. Yes it’s full of 70s sounds but it’s been so well done that it still feels fresh. Lot’s of bands have taken influence from 70s rock acts but Cats in space have picked different 70s sounds to inspire them and as a result they stand out from the crowd. This really is a superb album – the vocals are fantastic and the music is flawless. There’s a lot of variety between the songs but it’s been put together so well that they flow perfectly, so you go through rock, pop, disco and more rock without ever thinking anything sounds out of place – these songs just belong together. Cats in space – Cats alive!